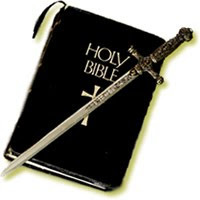 What does the Bible say about violence and the sword? The story here might easily be tossed aside as a lonely example, pertinent only because of Christ’s call to die for our sins, rather than a general principle. However, a careful view of Christ’s teaching show this to be totally consistent with the whole of his thought. In the beatitudes Christ lists the peacemakers among those who are blessed. He then goes on in both the Sermon on the Mount (Matthew 5, 6, & 7, esp. 5.38-48), and in the somewhat parallel Sermon on the Plain (Luke 6.17-49, esp. 6.27-36), to talk about the proper reaction to persecutors and enemies. It is crucial to note that violence is specifically excluded. We are to turn the other cheek, to go the second mile, etc. There are specific actions mentioned that exclude violence. If you are turning the other cheek, the precludes the revenge of striking back. If you are to go the second mile, you must go the first. Hence, violent revolt against the unjust command is impossible if we are to respond as Christ instructs. The text suggests the whip of cords is made, but we don’t know for sure how it is used. Saying that Christ threatened people with it is just as speculative as saying that Christ made it but never used it. We simply are not told what Christ does with it. He could have driven out the people violently with it, He could have driven the animals with it and this chased the people out among the stampede, or He might have done nothing with it. Christ does not follow any of the passages with instructions to His disciples that they should look at this behavior as a model. The passages in Matthew and Luke above clearly contain instructions that we are to follow these teachings, while the clearing incident does not. To use this passage to trump the Sermon on the Mount and the Sermon on the Plain is poor exegesis. Christ is fully divine and fully human. In short, the Temple was His house. His zeal in this case may reasonably be explained as His divine zeal for His house being expressed through action. Surely, we have the Spirit inside of us, but this does not give us the right to act as if we are allowed to use this divine mandate for justice through violence ourselves. (See the previous point.) That is, for Christ as God to use limited violence (if that is what happened) is not to imply that we have authorization to do so. Christ was using His rightful power. Violence is always about power. I’ve discussed power previously in this series here. Tomorrow, I plan to come back with a look at Romans 12 and 13 and what this implies about the view of violence in the New Testament Church. As for the whip in the temple…allow a farmer to give some insight…if you want to get a sheep to move, just yelling at it doesn’t always work…goats are even worse… cows? Yeah…good luck… You get a stick and give ’em a whack…THEN they move…if Jesus was clearing out the critters, a whip is part of the tool kit…. Thus the “all” is identified as the animals, the sheep and oxen, not the people.